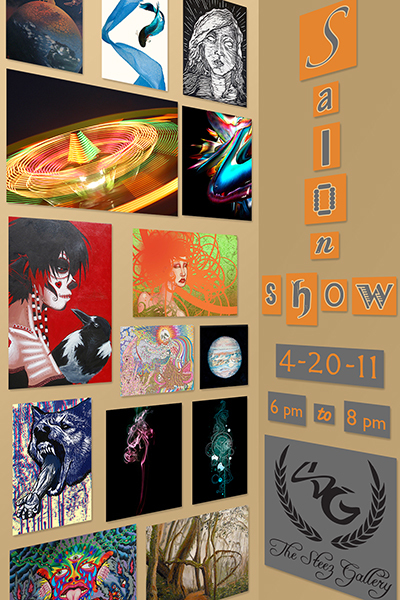 Come join us for the grand re-opening at The Steez Gallery on 4/20/2011 at 85 W Pearl St in Nashua, NH! We will be a hosting a salon style showing of artwork along with a pizza/Dance party, 42.0% off On almost everything (Some headies excluded), giveaways all day, free Raffle, beats, a new store a facelift, and more! Traditionally, a “salon” style event was an annual exhibition of the work of living artists held by the Royal Academy of Painting and Sculpture in Paris, originally in the Salon d’Apollon in the Louvre in 1667. Today, we celebrate a “salon style” showing as an event where artwork is hung from ceiling to floor, fitting as much artwork as can be shown on each wall.